Please contact the school's enrolment registrar for a prospectus and registration form. There is no cost involved. All registrations must be accompanied by a copy of the child / children’s birth certificate and Temporary Resident Visa if applicable. The date of lodging a Waiting List Registration Form will be used as a guide in the priority of enrolment. It is essential that we are notified of any changes to information on this form. Failure to do so could affect your child’s future enrolment. 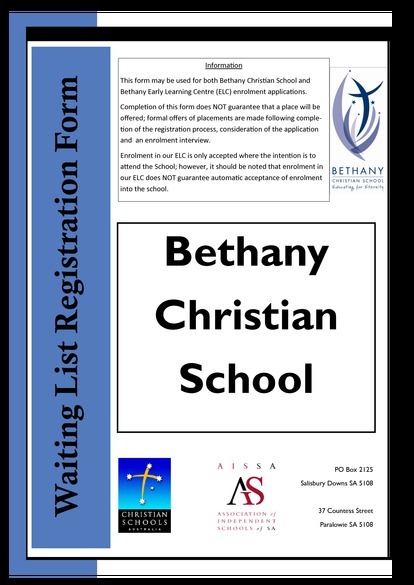 Cancellation of a Registration prior to commencement at Bethany Christian School must be made in writing to the Enrolment Officer. From 2015 children are able to commence on the first day of school at the start of the year providing they are 5 years of age before the 1st of May of that year. When the Principal offers a position, parents/caregivers will be given the enrolment forms to complete. The position for a child is secure upon the receipt of the completed forms and the $50 enrolment fee. This fee is paid once per family.